This oil-on-canvas painting “Die Begründer der Deutschen Gesellschaft für Chirurgie” by Wilhelm Gentz., portrays the founders of the German Association for Surgery (Deutsche Gesellschaft für Chirurgie) and can be seen on the first floor of Langenbeck-Virchow-Haus in Berlin. It was unveiled on April 18, 1894, with the occasion of the 23rd Congress of the Society. 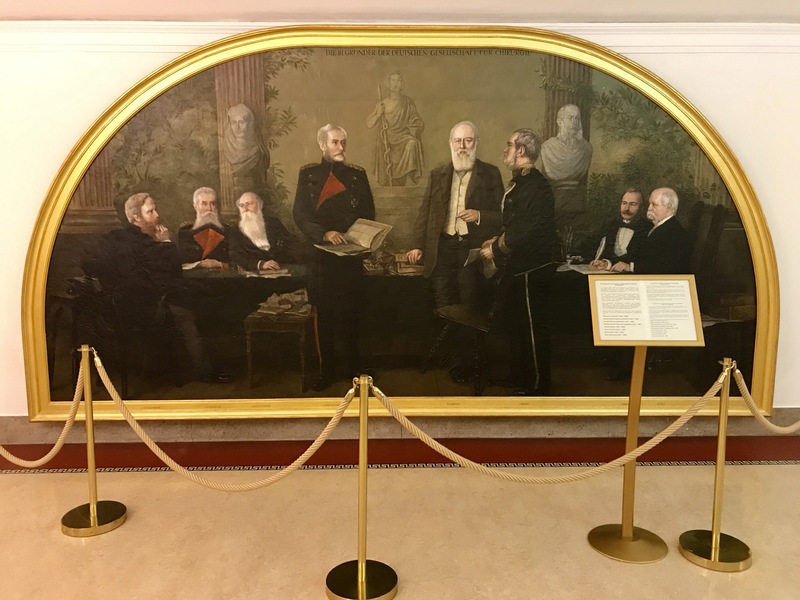 It represents, from left to right: Richard von Volkmann, Friedrich von Esmarch (developer of the Esmarch bandage), Adolf von Bardeleben (the first to introduce antiseptic surgery after Joseph Lister in Europe), Bernhard von Langenbeck, Theodor Billroth, Victor von Bruns (leading developer in the field of plastic and reconstructive surgery), Gustav Simon (the first to perform a successful nephrectomy in humans) and Ernst Julius Gurlt (who is renowned for his studies in medical statistics).